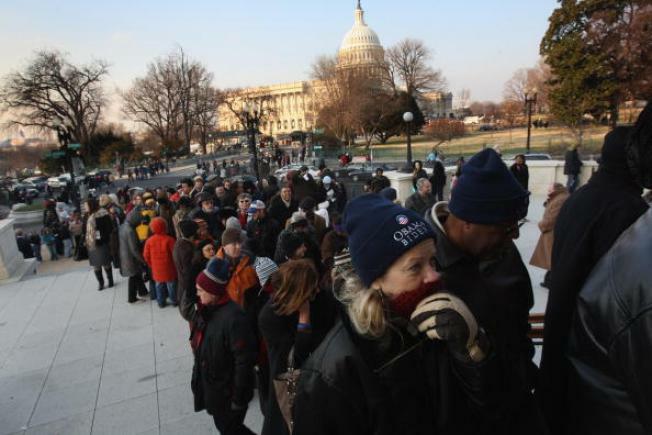 People waited in long lines to pick up their inauguration tickets, Jan. 19, 2009. President Barack Obama's second inauguration takes place Monday, and there's a lot going on. In an effort to keep you up to date, we'll be bringing you a daily round-up of interesting news, notes and stories — like how to do the weekend on a "budget" and the favorite baseball team of the guy giving the benediction. Hoping to attend the inauguration in style, but on a budget of less than $500,000? The $250,000 “Washington Premium Partner Access” from the Inaugural Committee and the Ritz-Carlton Georgetown’s $201,300 “West Wing” package will leave you for enough money to buy tickets and some new threads. But be careful about where you get your tickets, because while they're selling all over the Internet, they're supposed to be free. Sen. Chuck Schumer has been shutting down on-line sales. For the second inauguration in a row, President Obama has had to find a replacement pastor to give the benediction after his first choice was found to be politically unsuitable. But what do we know about Rev. Luis Leon? Other than the fact that he hates the Yankees? Curious about all the musicians playing throughout the weekend's festivities? Want a playlist of some of their biggest hits? Here you go, thanks to the Today Show. Obama rose through the ranks thanks in large part to his gifts as a public speaker, and he'll be on the mic again come Monday, but he'll be facing a huge challenge: "Second inaugurals are generally little remembered and long forgotten," Yahoo News says.